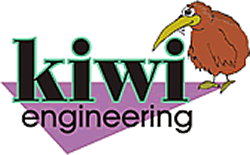 At Kiwi Engineering we try to adhere to an individual customer's demand for the engine being constructed with regard to its use and the intended budget. Some of the engines exhibited on this site can take years to complete and cost tens of thousands of dollars. Vintage engines valued at approximately $1,000,000.00 have been worked on in our facility. It is obvious that the utmost in care, fabrication, and assembly needs to be adhered to when dealing with something of this value. On the other hand we can deal with routine engine machine tasks right down to the car you drive to work every day. Each of these tasks, whether a custom race or show engine or the street "daily driver" version requires different attention. 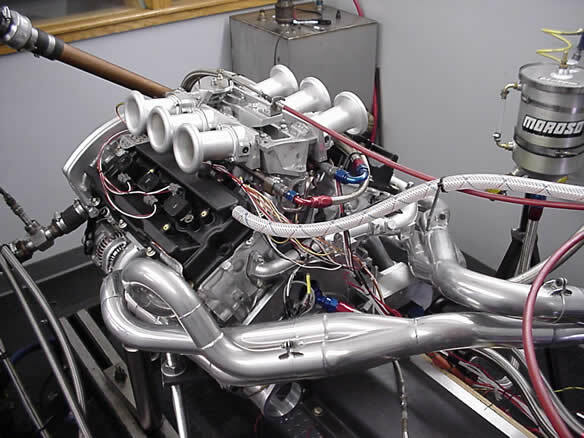 The cost of a single "one-off" crankshaft for a custom application may be more valuable than an entire engine from many current street automobiles. Those who are familiar (or may not be) would find that it is unusual to use the term "we" to describe this business even though it is a "one man" operation. There are, however, hundreds of people who help to make every single engine operation a reality. Vendors all over the world are called upon to provide and/or fabricate pieces and components ESPECIALLY with regards to the racing and restoration projects. The hope for this web site is to inform perspective customers of the varied projects undertaken by this business. Kiwi Engineering is not a "household word". It is a small and specialized business that has and is performing work for various people all over this country. Look at some of the project photos and decide if we might have the experience to tackle your project. 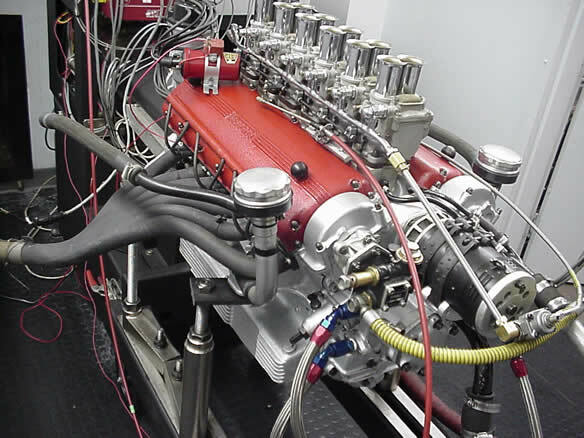 This Ferrari Testarossa is rebuilt and ready to tune on the dyno before installation in the race car. This engine has competed in the Shell Ferrari Historic Challenge race. This SCCA GT-2 Nissan 350Z was built by a well-known SCCA engine builder with the exhaust system, cylinder head development, intake manifold modifications, engine management work, and camshaft integration done at Kiwi Engineering. This engine, both in this configuration and in different future iterations, has won SCCA GT-2 National Championships in 2003, 2008, and 2010.